In addition to presenting both competitive surfing and memorial awards, Ian Walsh’s Menehune Mayhem also recognizes academic achievement. 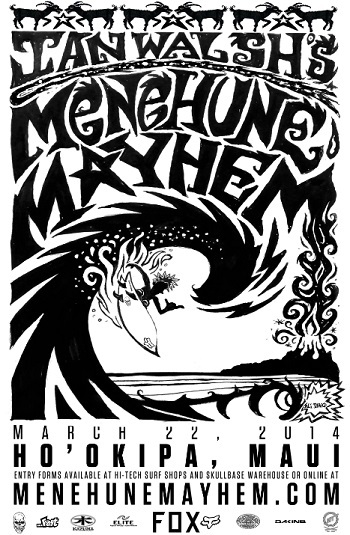 HO‘OKIPA, MAUI (March 25, 2014) – Ian Walsh’s Menehune Mayhem celebrated its 11th Anniversary on Saturday, March 22nd. The 4 to 8 foot stormy waves provided the 150 young contestants surfing in 10 divisions a highly contestable surf at Pavills Peak. 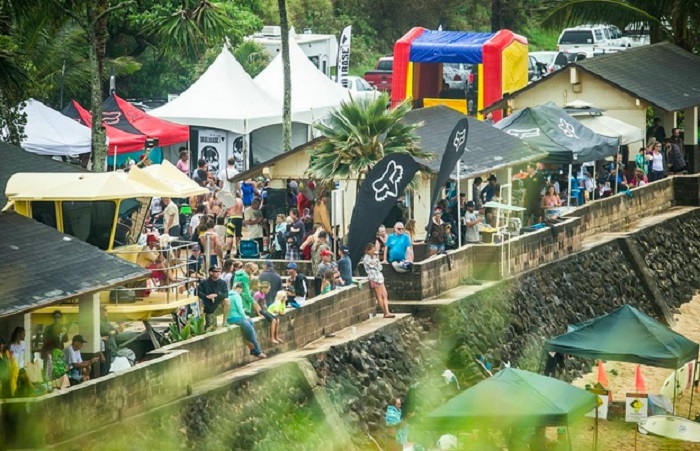 Menehune Mayhem is a surf contest that embraces the community of Maui and the scholastic achievements of its participants. “When I first started this event 11 years ago it started as something for the kids to look forward to and give them something to do at the beach because there was a lapse in surf events on Maui at that time,” says Walsh. “It’s something that has grown into a carnival like event. Each year I love bringing new activities to the event and this year I was especially excited to bring Matt Kinoshita of Kazuma Surfboards and his son Chaz to do a demonstration of how to shape a surfboard. We basically brought a shaping bay to the beach where we had a live shaping seminar. This helped the kids see how a board is shaped and learn what it is they are riding while giving them the opportunity to watch and ask questions to Matt and Chaz. Matt was my first shaper more than 20 years ago and that made it even more special.” says Walsh, who is an internationally recognized professional surfer and Maui native. Thank you to all the sponsors that supported and made this event possible: The Walsh Family and special friends, Fox, Dakine, Skull Base, Lost Surfboards, Kazuma, Elite Physical Therapy & Sports Medicine, Flatbread Company HI Tech Surf Shop, Taiko Drums, Keiki Art Center and Kalama Middle School. Founded in 1974, Fox Head Inc. has maintained its position as the innovation leader in the MX industry by designing and producing motocross protection and apparel for the world’s best riders. Building off this athlete-driven design philosophy the company has expanded its activity and products into MTB, BMX, Surf and Wakeboarding. Fox is a privately held company with offices in Irvine, CA; Morgan Hill, CA; Calgary, AB and Barcelona, Spain.